Most navigation software has assumed that automobile drivers were the only ones using the road. Then came Ride the City. 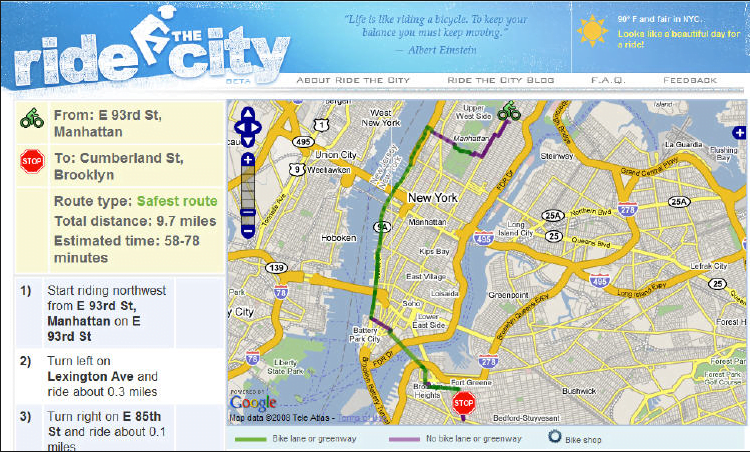 Launched in 2008, Ride the City was one of the first mobile phone navigation apps built by cyclists, for cyclists. It was specifically designed to help urban bike commuters find the safest routes to ride their cities, favoring lower traffic thoroughfares and roads with bike-friendly infrastructure. Before Ride the City, most cyclists had to learn the “safe” routes by trial and error. Ride the City proved integral in helping Asheville on Bikes and our community partners identify the clear need for more bike friendly routes in our city. The app not only illustrated just how out of the way cyclists often had to go to ride a safer route, but also let users rate suggested routes, warn others of potential hazards and report on time spent en route—having this data helped us more effectively advocate for improvements with local transportation officials. Technology changes rapidly, and the app is no longer available. However, our work to create safer cycling routes continues, and thanks to our members, sponsors and business partners, Asheville on Bikes has a real, positive impact on making our city’s transportation system safer for all road users.